“Archdale Square” was granted to Thomas Archdale, one of the Lords Proprietors. Archdale was a child, the son of John Archdale and Ann Cary; his father purchased the proprietor’s share in 1681 in trust for Thomas, and his father was trustee of the real estate. There seems to have been little development on the lot while it was in Archdale’s possession. His father was appointed governor of Carolina in 1694, and spent about a year in Charleston (August 1695-October 1696) before returning to England. Proprietor Thomas Archdale might already have left Carolina: he was elected to Parliament in 1699, after an Oxford education. 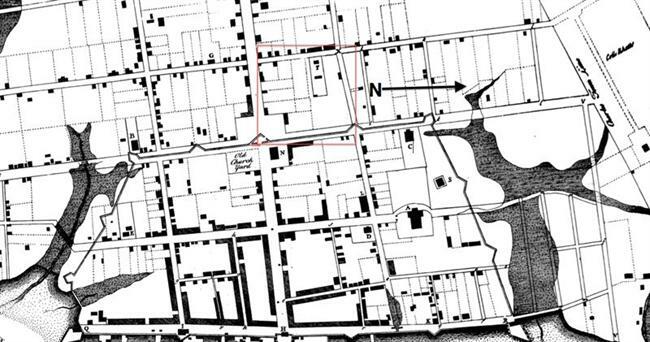 In 1695, during John Archdale’s term as governor, William Sadler received a grant for Lot 97, in the northwest corner of Archdale Square (corner of King and Queen streets). 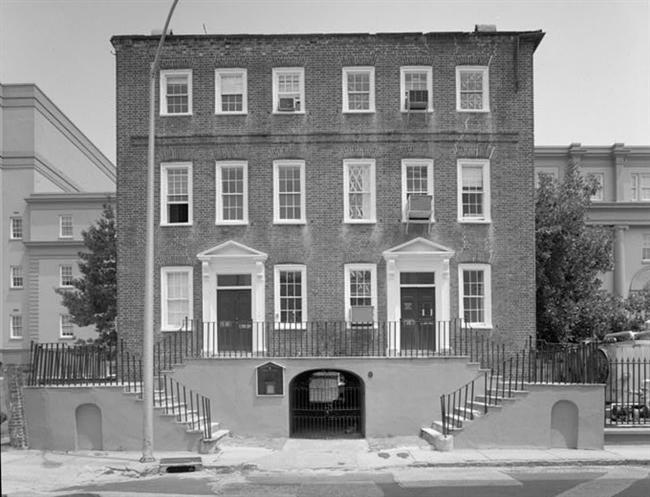 On the lot south of Sadler, a Quaker meeting house was established sometime before the “Quaker Lot” was warranted to Mr. Thomas Kimberly in 1717. Archdale Square has evolved through a series of residential, commercial, governmental, and institutional uses. 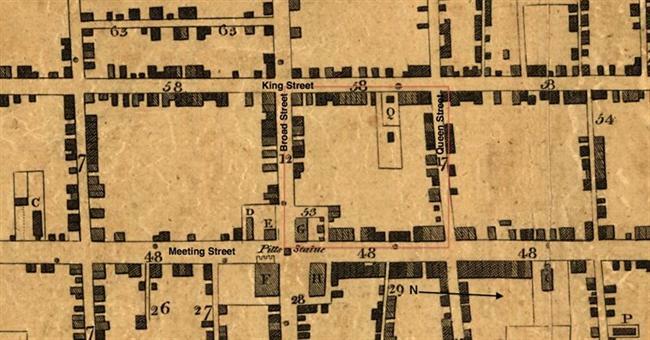 The Quaker meeting house and burial ground, the 1753 colonial house of assembly, the (original) Mills House Hotel, the Timrod Hotel, and many other buildings have disappeared from the block. 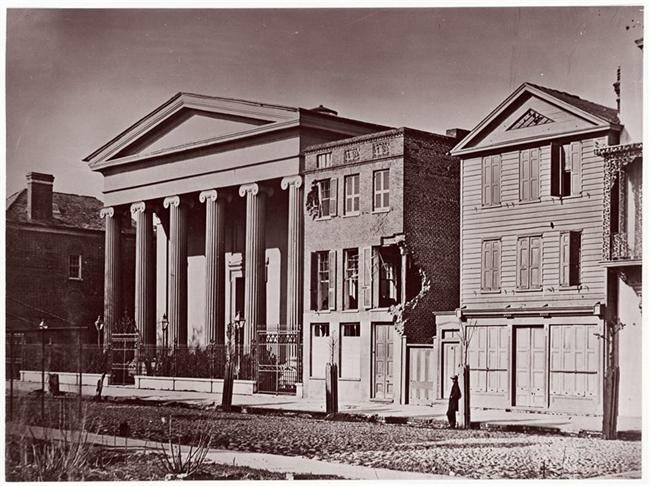 However, notable buildings remain: Hibernian Hall, South Carolina’s first state house (Charleston County Courthouse), and the Hebrew Orphan Society building. 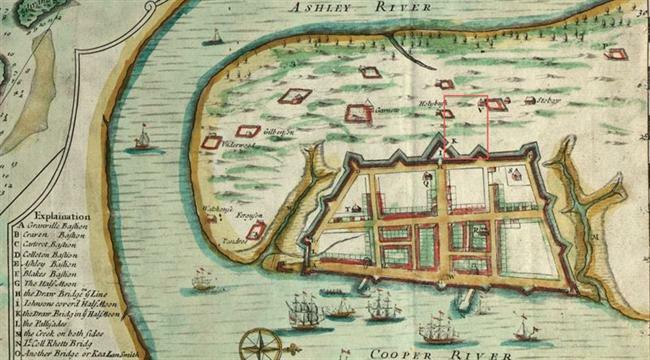 Archdale Square, 1739. “F” marks the Quaker Meeting House. The town wall and gate seem to have extended into the corner lot where the colonial assembly hall would be erected. In 1999, part of the fortification wall was uncovered, eight feet below street level. 1788 map showing State House Square (53), the building “formerly State House now Court House &c.” (G), and “Quaker Church” (Q). Charleston County Courthouse, Broad Street, 1991. The colonial assembly hall and council chamber building, first used in 1756, burned in 1788. 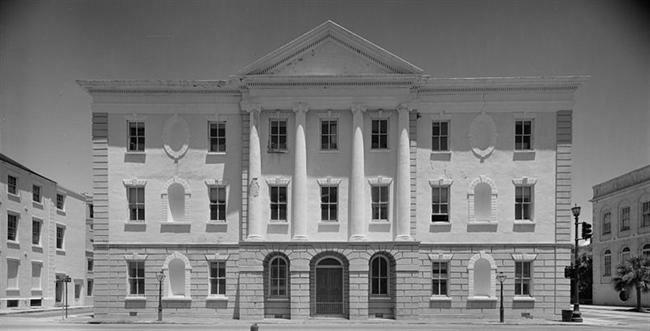 It was rebuilt as the South Carolina State House in 1792, but placed into service as the Charleston County Courthouse. The courthouse was restored after Hurricane Hugo. 2-4 Courthouse Square, 1990. The Daniel Blake Tenement House was built between 1767 and 1772. Hebrew Orphan Society Building, 88 Broad Street, 1934. Built ca. 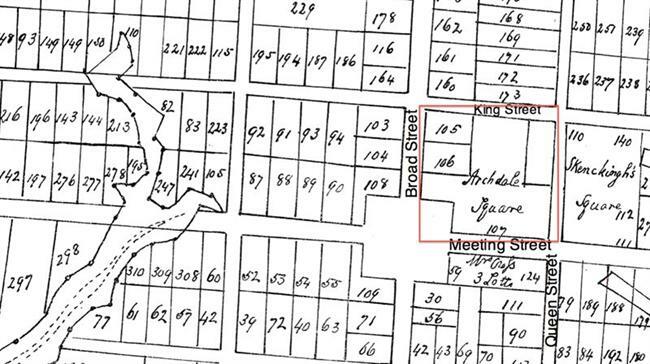 1800 on part of Archdale Square that was granted to Jacob Allen in 1696; housed the Bank of the United States and the Bank of South Carolina before its purchase by the Hebrew Orphan Society in 1833. 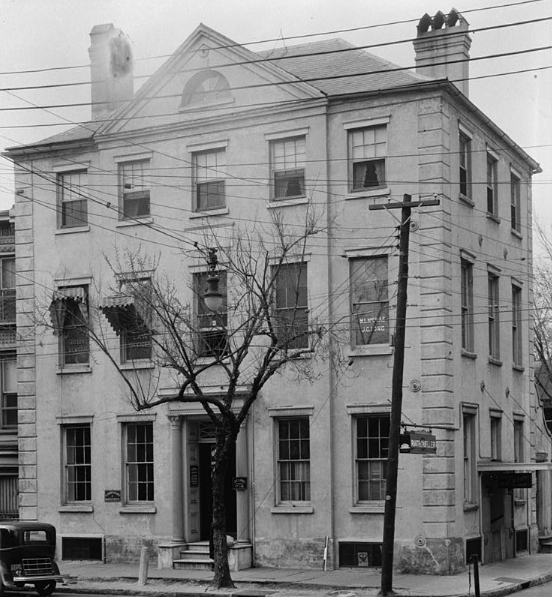 1940 view of Hibernian Hall (built 1839-1841), 105 Meeting Street. 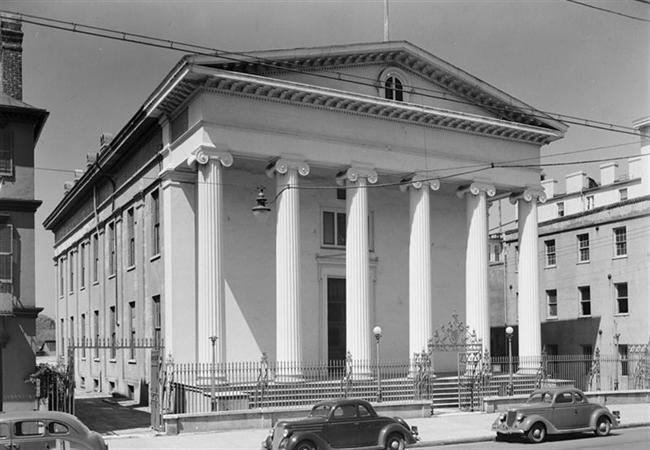 George N. Barnard, “Hibernian Hall, Charleston” ca. 1864. At right is the iron balcony of the Mills House Hotel. 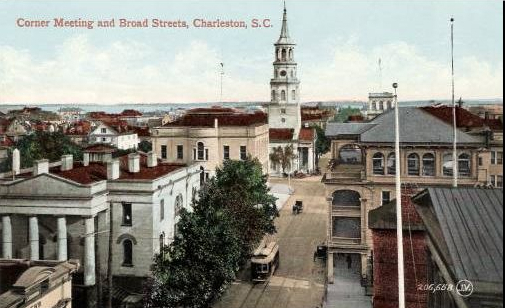 The Commercial Club stood on Meeting Street between the Charleston County Courthouse and Hibernian Hall. 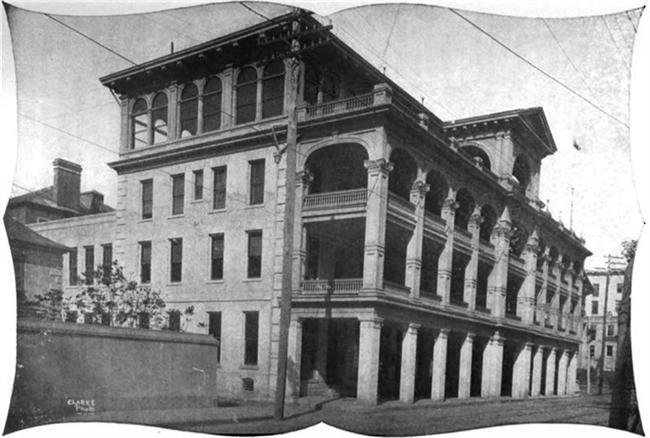 The building was a late-nineteenth century row of four attached tenements, remodeled as a residential/businessmen’s clubhouse ca. 1904. In 1918 the clubhouse was converted into the Timrod Inn (later known as Hotel Timrod). 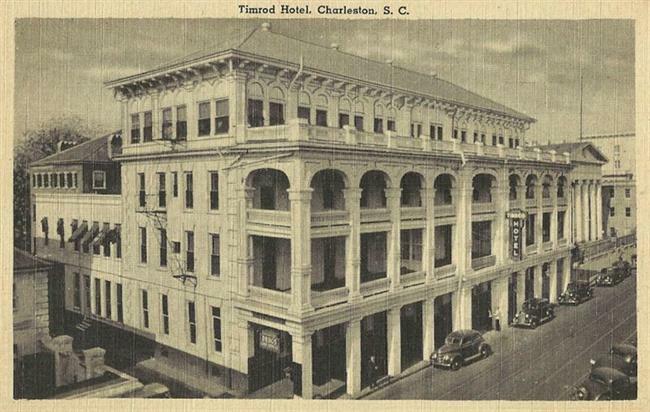 The hotel closed at the end of 1955, and in 1964 the building was demolished to clear a site for the O. T. Wallace County Office Building, today’s 101 Meeting Street. View of Timrod Hotel, facing south along Meeting Street.